Freedom House's report on Net Freedom in Bahrain in 2012 claims that "today over 1,000 websites are blocked, including individual pages on certain social-networking sites". This number is now even higher as last week, the Ministry for Communication Affairs announced that it was banning dozens more websites which it claimed were "affiliated with internationally recognized organizations that fund and promote terrorism". Amongst them was opposition media site Feb14media.com. The banning of this website also occurs at a time when the Bahrain government is cracking down hard against citizen journalists, whilst also preventing human rights defenders, journalists - and even tourists who are writers - from entering the country. Amira Asad is one such case who tried to enter Bahrain as a tourist yesterday. The authorities refused her entry and told her that anyone who is a writer or a journalist needs "special permission" from the Ministry of Interior. For more on the perennial problem of denying entry to journalists, see "Access Denied" by Bahrain Watch. 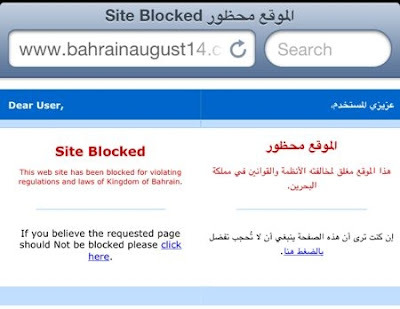 You can use TOR or PirateBrowser to bypass the Bahraini government's censorship. I know TOR has Arabic language instructions, although I am uncertain about PirateBrowser.